Miso (pronounced mee-so) is a salty bean paste, created by fermenting mashed cooked beans and salt with a culture starter called "koji." It is a traditional fermented food native to China and Japan, but is used in all parts of Southeast Asia especially Korea, Vietnam and Indonesia. Customarily, the soybean is the main ingredient found in Asian miso's, but it can alternatively be made with other types of legumes. Under the process of natural fermentation the cooked beans experience a biological transformation in which their proteins, oils, fats and carbohydrates are converted into easily absorbed fatty acids, simple sugars and amino acids. This produces a rich, fragrant condiment, nutritionally enhanced with enzymes and probiotic microflora that are very beneficial to the digestive tract. 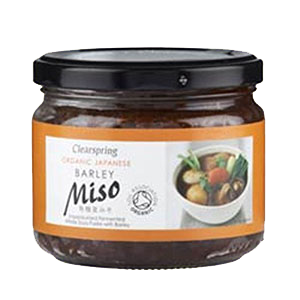 Miso paste, used as a condiment or added to soup broths, provides a nourishing superfood that helps to protect the body from radioactive substances in the environment and may also help to guard against certain types of cancers. It is important to note that these health properties are only found in unpasteurized versions, rather than pasteurized commercial products, which are void of any enzymes or beneficial microorganisms. Most people worldwide are familiar with this fermented food in the all popular "miso soup", which is the paste dissolved in hot water to create a rich broth. The soup usually contains other ingredients like shiitake, vegetables, seaweeds, tofu or tempeh. Traditionally, the paste is added to water that is below the boiling temperature to preserve the nutritional value of the miso. Kombu, or kelp seaweed, is also used in the soup to help give it the famed cloud-like effect. 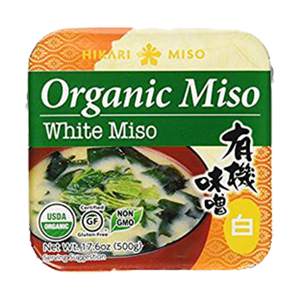 Miso contains iron, calcium, choline, tryptophan, folate, protein and vitamin K. Natto miso, which is made from whole fermented soybeans, specifically contains the hard to find vitamin K2. K2 works with calcium and vitamin D as an important nutrient for maintaining healthy bones, teeth and nails. Miso's origins date back to China during the first century B.C. 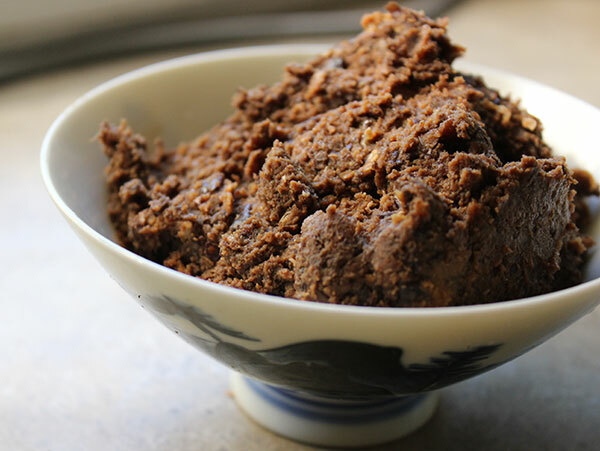 Early versions were thought to have been developed from the Chinese discovery of fermented fish paste, which also employed the use of koji to speed up fermentation time. 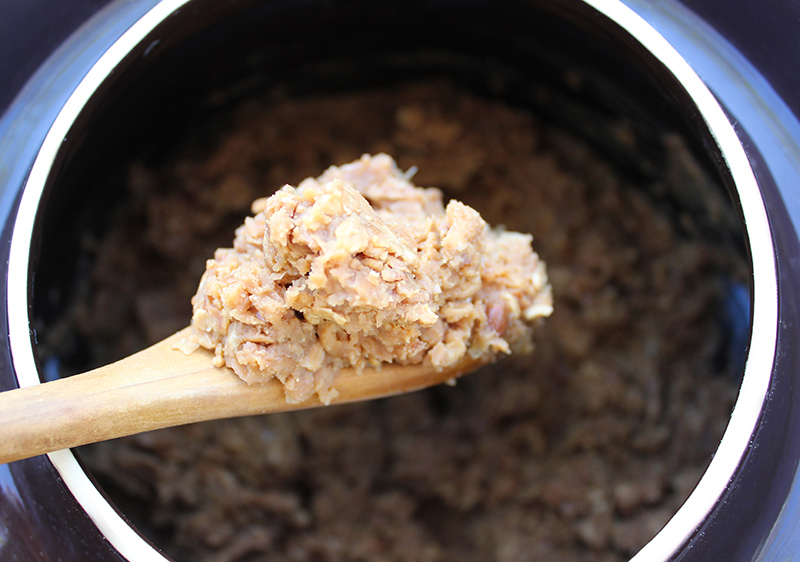 Eventually, soybeans and some grains were added and then used exclusively to create a mashed thick liquid, rather than a paste. 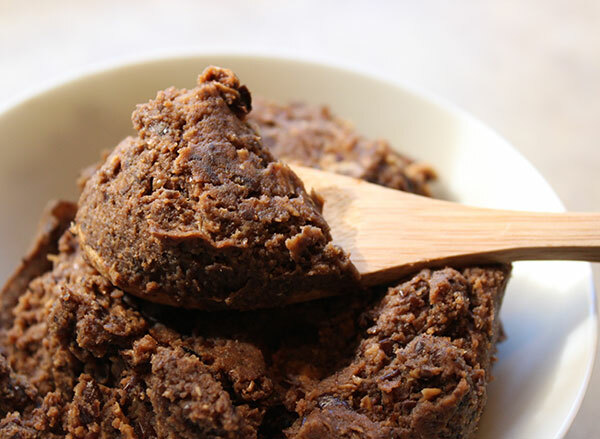 The fermented miso, as well as the soy sauce produced as a by-product of fermentation, was thought to have been spread by Buddhist priests in regions of Korea and Southeast Asia. 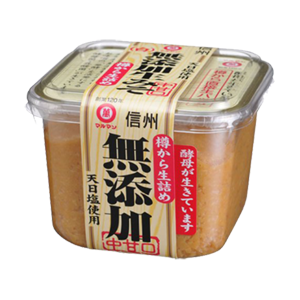 The paste-like version of miso we know today was further developed and perfected by the Japanese during the Kamakura period. They were the first to use it as soup broth in the all popular "miso soup." The macrobiotic health movement, which was popularized by Japanese teacher George Ohsawa in the 1960's, played a significant role in introducing miso to the Western world. 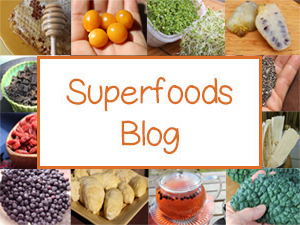 The macrobiotic diet and philosophy places a large emphasis on fermented foods, using them as a condiment with meals that are based predominantly on whole grains, beans, seaweeds and leafy green vegetables. Preparing miso is an artisan craft, like making fine wine, and Asian cultures are the masters. The methods and ingredients used can vary considerably depending upon type of miso and regional style. Regular - Using different koji starters, either rice (kome), barley (mugi) or soybean (mame). Special - These are two types called "finger lickin" and "sweet miso." Modern - Can refer to low quality commercial varieties as well as finely crafted ferments using other types of legumes besides soybean. Soybeans are a primary ingredient in most Asian miso's but the type of koji can vary and produce different tastes, textures and health benefits. 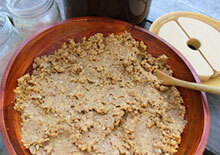 Regular miso's are fermented with different types of koji substrate, either rice, barley or soybean. When rice koji starter is added it becomes "kome miso", when barley koji is added it becomes "mugi miso" and when soybean culture is added it becomes "mame miso." The rice kome variety is by far the most popular, accounting for nearly 80% of all miso's created. Rice kome types can vary greatly either producing sweet, salty, red or white miso's. Similarly, mame and mugi styles are also classified by color, taste as well as the region where they are traditionally produced and are especially well known in Japan. Special miso's are distinguished from regular types because they can include other ingredients like vegetables, seafoods, sweeteners and seasonings. For example, the finger lickin variety is made with sauerkraut and hot spices. These variations have a shorter shelf life and are used mostly as toppings rather than in soup. 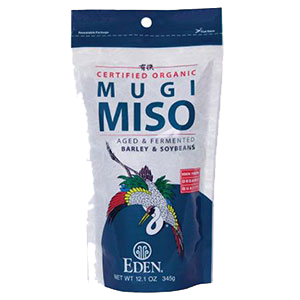 Modern versions are, as the name implies, "modernized" for commercial production, sometimes using blends of different miso's, refined sugars, additives and can be pasteurized or dehydrated for instant soup broth. The other definition of modern types can designate low salt miso or styles that use different kinds of legumes other than soybean, which are referred to as "new American miso's." 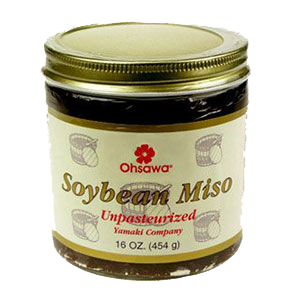 Most commercial miso's are made exclusively with soybean. However, miso can be made from any bean variety, not just soy. There are some American brands that have branched out to using garbanzo bean, aduki bean, black bean and other legumes. Most people today are less attracted to eating soy-based products because soy contains some "anti-nutrients" such as phytoestrogens, goitrogens, phytates, trypsin inhibitors and soyatoxin. They are also one of the top genetically modified food crops and are usually heavily sprayed with pesticides and herbicides. If you are going to consume soy, it is much better to eat organic, non-GMO soy-based foods that are fermented as opposed to non-fermented. 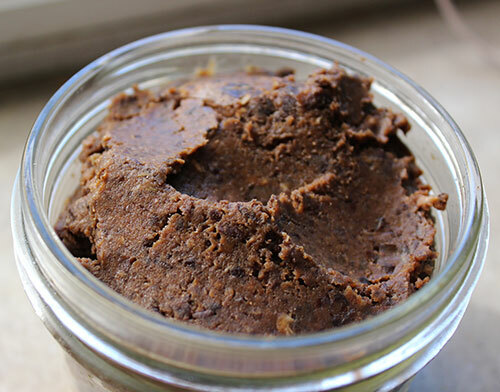 The process of culturing beans with koji (Aspergillus oryzae) into a paste produces an end product that is aromatic, sweet, robust and savory with deep earthy flavors. Because of its higher salt content it is not a food you want to eat by itself, but needs to be diluted into liquid broths or incorporated into recipes in small amounts. Longer aged miso's, over 6 months to 2 years, are more rich in flavor and generally have a darker color than those that have been fermented for less than 1 to 6 months. These longer ferments have higher amounts of salt content but have been proven to have greater health benefits as they have more nutrients, enzymes and microflora. 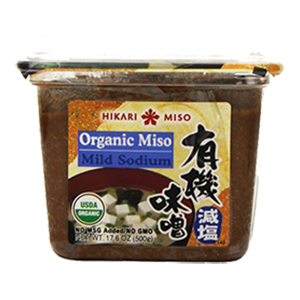 According to some research, the sodium content in miso does not seem to show adverse affects for those with high blood pressure or sensitivities to salt. This may account for why Japanese people who consumed lots of miso a day have low levels of cardiovascular disease and hypertension. It is speculated that this is due to the salt's reaction with certain fermented bean protein constituents. It is important to use miso in small doses, however, if you have high blood pressure, or related conditions, and see how it works with your unique body type. In a recent 2013 study in the Journal of Toxicologic Pathology entitled "Beneficial Biological Effects of Miso with Reference to Radiation Injury, Cancer and Hypertension" it states, "Data showed that sodium intake was the highest in Japanese but that the Japanese also had the lowest blood pressure. It seems that sodium intake was higher but that blood pressure was low and individuals lived longer." 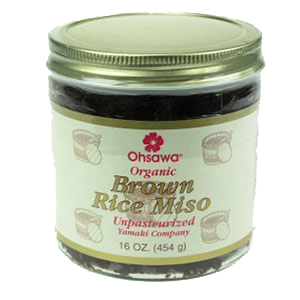 Unpasteurized high quality aged miso is a very beneficial food for the digestive tract. It is packed with enzymes that are naturally created over time from the interaction of the koji starter and other ingredients. This provides an enzyme-rich food that is very helpful if your current diet is particularly low in raw fruits and vegetables and high in cooked foods, meat proteins as well as highly processed, canned or packaged foods. Our digestive functions naturally provide saliva and digestive enzymes to break down our food into usable nutrients, but most of us today are extremely compromised in the "enzyme reserve department." Over time eating foods low in enzymes reduces one’s own digestive enzyme reserves. Fermented foods like miso can be of exceptionally great benefit to help process and remove undigested waste material that may be hindering our overall health. 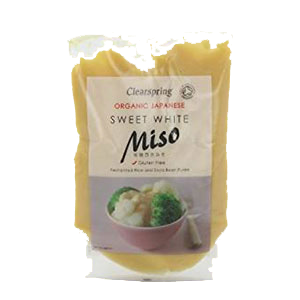 Miso paste can be added to many recipes as a salt replacement and it only takes a small amount, less then a teaspoon, to aid the digestive process. These extra enzymes help us to more effectively utilize the nutritional components of the foods we eat. 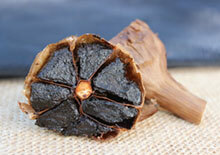 This can boost energy levels, eliminate toxins, normalize bowel movements and strengthen the immune system. 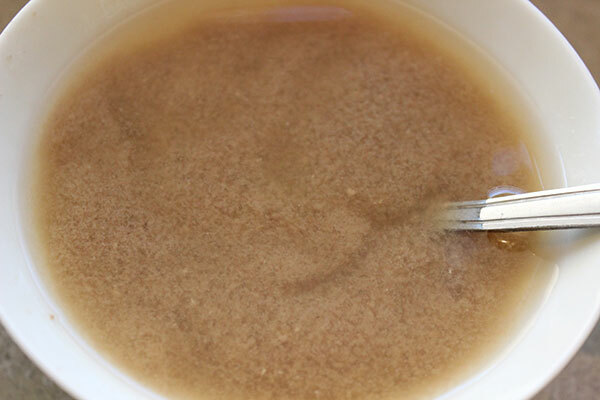 Miso, through the process of fermentation, produces an abundance of friendly probiotic microflora, mostly lactobacilli (members of the lactic acid bacteria group). These organisms are helpful for supplying greater balance to the intestinal ecosystem and neutralizing pH levels. It is good to have at least 80% alkaline friendly bacteria and 20% of the other acidic microorganisms, like candida albicans, which are actually helpful to the health of the intestinal tract in smaller amounts. These friendly microbial bacteria are particularly useful at converting more nutrients, vitamins and minerals out of the foods we eat, making them more bio-available to the body to use as nourishment. Strains of Lactobacillus spp. 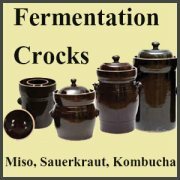 and other lactic acid bacteria present in cultured foods, like miso and sauerkraut, may possess potential therapeutic effects as anti-inflammatory agents. Probiotic ("pro-life") rich foods, like yogurt, kefir, sauerkraut and kombucha, also help to replenish the digestive tract after periodic or long term use of antibiotics ("anti-life"). "By enjoying miso soup each day, your constitution will gradually improve and you will develop resistance to disease. I believe that miso belongs to the highest class of medicines, those which help prevent disease and strengthen the body through continued usage. Some people speak of miso as a condiment, but miso brings out the flavor and nutritional value in all foods and helps the body to digest and assimilate whatever we eat." Miso soup consumption has been proven helpful for chelating the effects of radiation exposure. This was first made evident in the atomic bombing of Nagasaki in 1945 by Dr. Shinichiro Akizuki. Dr. Akizuki was the director of the Department of Internal Medicine at St. Francis Hospital in Nagasaki. He and his staff consumed bowls of miso soup daily and fed their patients a diet of miso soup and sea vegetables. These fallout victims, who were just one mile from the epicenter, did not experience radiation sickness compared to other survivors in the city who suffered from severe radiation poisoning. In the Chernobyl nuclear power plant disaster of 1986, many local people consumed miso soup as a preventive measure against radiation disease because of Dr. Akizuki's findings. It was discovered in 1972 that the main component in miso that helps to provide a shield against radiation is a certain compound called dipicolinic acid. 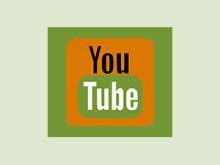 Dipicolinic acid is produced from the beneficial bacillus bacteria in aged miso and is an alkaloid that specifically helps to chelate heavy metals and radioactive isotopes from the body. Studies have shown that women who consume the soup on a regular basis are less likely to get breast cancer. These health properties may also be linked to its ability to bind and eliminate heavy metals from the body, which can greatly reduce toxic burden and increase immune responses. In a study published in the Journal of the National Cancer Institute it states, "In a population-based, prospective cohort study in Japan, frequent miso soup and isoflavone consumption was associated with a reduced risk of breast cancer." 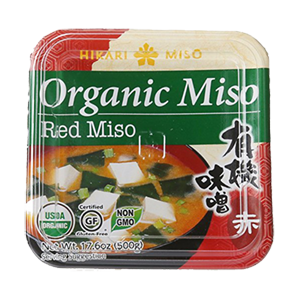 Several human and animal studies were conducted by Dr. Hiro Watanabe, a leading authority in developmental biology and cancer prevention in Japan, to further understand the protective effects that regular miso intake has against cancer and radiation exposure. 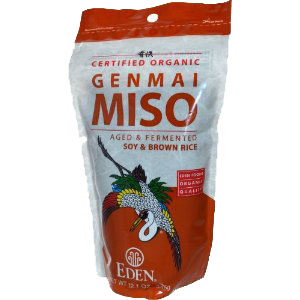 It was again shown that aged miso's, fermented between six months to two years, had the most beneficial influence, specifically with breast as well as prostate cancer. In one study conducted by Dr. Watanabe and other specialists on the effect of miso on rat mammary tumors, it was stated that "The data suggest that miso consumption may be a factor producing a lower breast cancer incidence in Japanese women." 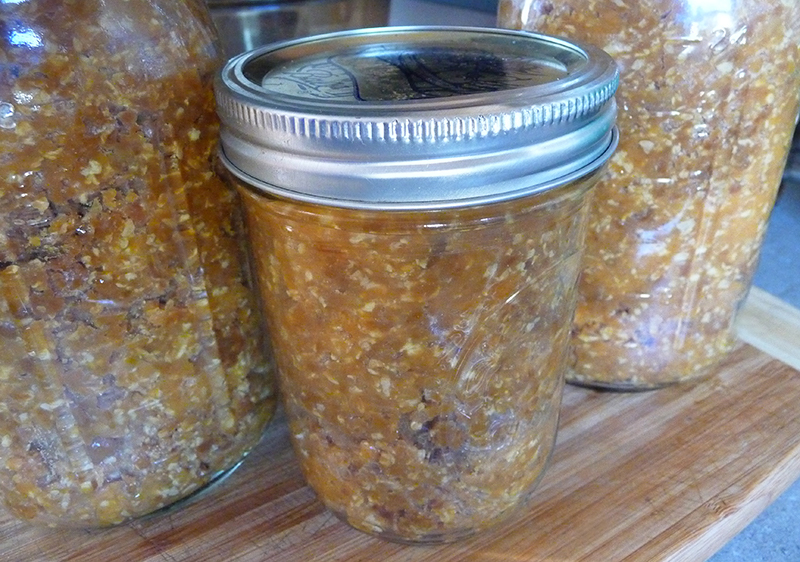 We are great advocates of making homemade-style miso whenever possible and have been making our own for many years. It is cost effective and most of all you get to control what beans to use as your base. This could be one particular bean, like garbanzo, or it could involve a blend of several different beans and other ingredients. It is best when you are new to homemade miso making that you start out with a basic recipe, using one bean variety, and build up to more elaborate versions over time as you become familiar with the fermentation techniques and process. It is important to consume unpasteurized commercial brands only as pasteurization destroys all of the enzymes and lactic acid forming bacteria that act as digestive aids. Many companies do this so that it stops fermenting and producing carbon dioxide, which can cause the container it is packaged in to possibly swell or explode. In addition, it is best to purchase or make homemade miso using high quality mineral or rock salts as oppose to refined table salt. Miso paste is not only excellent in soups and broths, but its also delicious as a base for marinades, gravies, dressings, sauces and spreads. We use it as a dressing or sauce for sushi, our raw pad Thai and seaweed salad recipe. It can also be added to savory dishes. 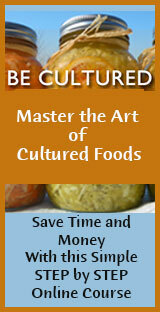 We use it in our wild rice recipe and watercress soup. 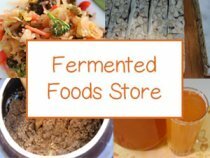 See our fermented food recipes page for our top 7 fermented food favorites in the link below.